Workshop, "Voices of our Young Marists", Ellen Salmi and Opal Vadhan were on this panel. Sharing a meal: Jack Ridout, Sr. Frances Feeley, SM, Fr. Paul Frechette, SM, and Sr Palepa Ioane, SMSM. Two copies of a new "Fourvière pledge" that we all signed after the final Mass. 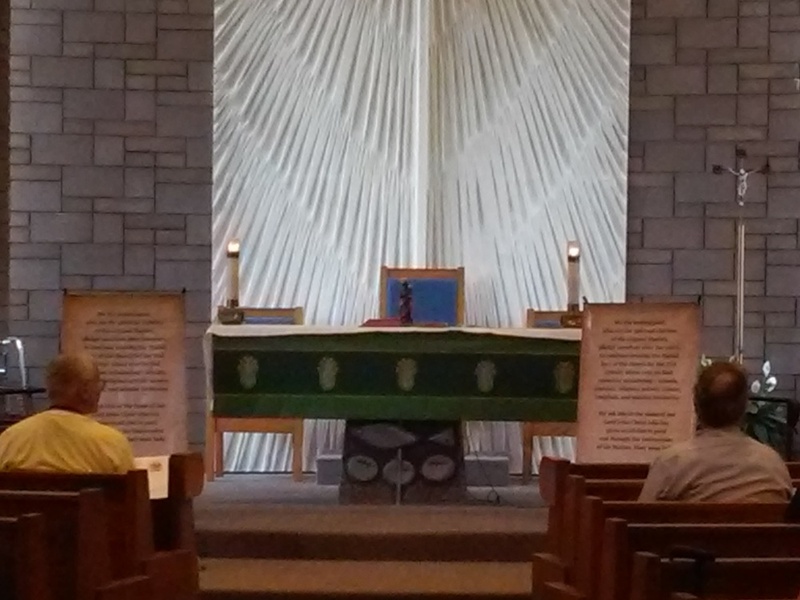 The closing Eucharist at the Conference, July 22nd, 2016. While many Marists were celebrating the Bicentennial in Fourvière, in Lyons, France, about 130 representatives of Marist communities in the USA gathered for a Fourvière Conference at the St Alfonso Retreat Center in Long Branch, New Jersey from July 18th-22nd. There were keynote presentations on the "Pledge of Fourviere", by Father Paul Frechette SM, "The Spirituality of Jean Claude Colin as seen through the eyes of Marcellin Champagnat" by Brother Sean Sammon FMS, and "The Marian Face of the Church" by Sr Linda Sevcik, SM. There were eight different workshops to choose from on Tuesday and Thrusday, including one called "The Voices of Young Marists", presented by young adults who were associated with one of the Marist congregations. Ellen Salmi, who was a volunteer in our mission in Senegal, and Opal Valdhan, who volunteered in Jamaica with the the SMSM's, were both on this panel. Every evening there was a presentation on the charisms of the different communities, and there was lots of time at meals and at the evening socials for informal conversations. We all agreed that we learned a lot during this week about the "other branches" that we didn't know before! The week ended with signing a new "Pledge of Fourvière", after the final Mass. We re-committed ourselves anew to sharing in Mary's mission in today's world.